This time of year many homes open their doors for house tours. 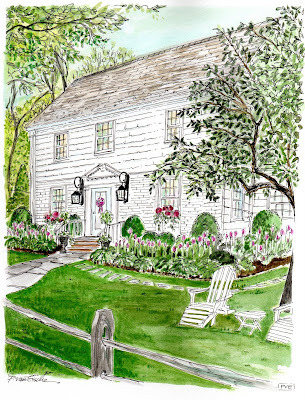 Eddie Ross posted this charming home and I just had to illustrate it. 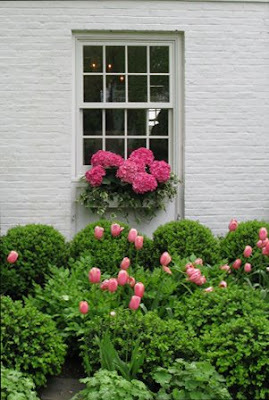 Just look at these window-boxes and tulips! If your house were part of a tour, what would you do first to get ready? put something in the oven, probably cookies. the smells of a home make the first and leave the most lasting impression! The quintessential American house. Those window boxes!! Gorgeous. The first thing I would do?? Tie a big bow around Edward's neck! That was a gorgeous window box- great curb appeal and the interiors were even better! First I would get hysteric, then call the cleaning lady, bake a cake and later make some coffee so the house smells like HoMe!! Beautiful work Patricia. I always love your homes. All I would do to mine is make sure I had fresh flowers in the house. Beautiful house and drawing. I love the window boxes. I would probably dust! !Have a great Friday! What would I do first? I would have classical music playing softly in the background. This house spoke to me on so many levels when I saw it at ER. You have certainly captured all that helps it speak "Welcome". I would set a pretty dining table and lots of flowers. So far we have nice music, tidy homes, flowers and something freshly baked, bows on our canine friends, and hopefully the hysterics have stopped, along with the rain! As always your comments always make me smile! house tour... hmmm... i'd have to tidy up the kids random toys and my own random stacks of paper strewn around every corner. i'd get fresh flowers, throw something yummy in the oven and make a nice pitcher of iced vanilla coffee to offer the guests, a little music and hopefully nice conversation to follow. oh yeah and then i'd make sure to ask everyone who came by if i could go look at their houses one day, as others peoples places are always more interesting! what a great post. the first thing I would do would have to be remove the bikes, scooters, etc. from the front door. then I would go inside, turn on the music, pour myself a glass of wine, and figure out what I just got myself in to! We have baskets around the house for storing toys when our boys aren't playing with them. All of those baskets would go into hiding in the basement during the tour! If it were autumn, I would pour some apple cider into my slow cooker and add a few cinnamon sticks. The smell is wonderful! If my house were on a tour, well, it just couldn't be. There's way too much to do. Unless, the tour was twenty years from now. Very pretty! Probably think of a little favor or bake a warm cookie to hand out and call my friend for flowers. What a beautiful home. Love the illustration. The first thing I'd do is clear the piles of the dining room table. Then get some music on and really start cleaning. I'm speechless...that window box and tulips below are so lovely. I will always be a flower-loving person. Your talent is just something extra. Clean! And order flowers. It's a charming portrait - you completely captured the feeling of it. Your illustration of this beautiful home is just lovely! You have such talent and such a peaceful artistic style. Now about the tour and the invitation sent to Eddie Ross...WOW! A brave woman with lots of confidence and more time (or help) than I have to whip my home into shape for such an event or notable guest. Bravo to her! THAT is beautiful! Coincidentally, I'll be shopping for window boxes this weekend! 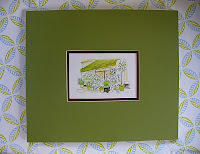 I loved this home on Eddie's website, but your painting is even more charming (if that is possible!). You have an incredible talent! not with your 10 minute rule! tee hee. you would have the place picked up, and looking spiffy in no time! ding, dong! What a pretty home! And, the hydrangea in the window boxes, pure genius. Also, a HUGE fan of proportionally correct outdoor light fixtures. Why does everyone tend to go small? I'm dying over the flower boxes!! soo pretty!! Patricia this is so charming! 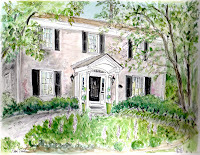 I loved seeing that house with the pretty hot pink hydrangea on Eddie's blog. If I were to have a house tour, the first thing I'd do is probably panic and the second is make way too long of a "to-do" list!!! When I saw this house on Eddie's post I was blown away! It just screams charm and your painting is stunning! How I wish I had your talent! I would have Stephanie that was featured in Eddie Ross's post to come to my house and create more beautiful floral arrangements! This is such a charming home, Treeba and your painting captured it perfectly. Have a wonderful weekend! What a beautiful illustration! I think the first thing I would do is make sure the foyer is clean of dust bunnies and the house smells good. Nothing is better then walking into a great smelling home. that house is so pretty. my favorite houses are white and black. i love your illustration of it too. if my house were were being seen....i'd clean. it would HAVE to be cleaned seriously bad. So beautiful, Patricia! Elizabeth is thrilled, I'm sure! Thanks to each of you for your kind words! 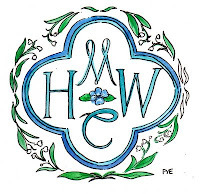 Let the house tours begin...I plan to show many wonderful homes...in the coming weeks. "A comment" from Eddie! I am thrilled! I just went on a couple of house tours including an INCREDIBLE show house...made me want to come home and get rid of everything I own! That is what the outside of my house wants to look like when it grows up. 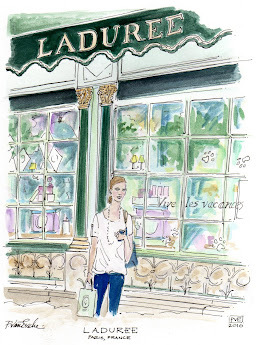 Love your illustrations! Move. It's a disaster area. Beautiful! Love the surroundings, it was so green and so fresh in the eyes. I would have to get rid of the clutter which has become all but invisible to me. We’re Hiring, Here’s the Scoop! pve design copyright. Simple theme. Powered by Blogger.